1. Bring 350ml fresh vegetable stock to a simmer in a medium pan, add 80g jumbo oats and cook over a low heat until they begin to soften (about 2-3 minutes). 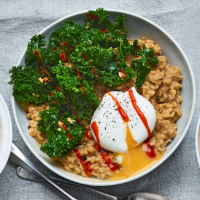 Stir in 1 tbsp brown rice miso paste and 1 tsp grated fresh root ginger, and cook until the oats are soft and to your desired consistency (about 5 minutes – we like it a little thicker than sweet porridge). 2. Meanwhile, in a separate frying pan, heat 1 tsp vegetable oil and sauté 1 crushed garlic clove and 50g torn kale leaves over a low heat for 3 minutes. 3. Divide the porridge between 2 bowls, seasoning if liked. Top each with the kale, a poached egg and a drizzle of sriracha chilli sauce, if liked.